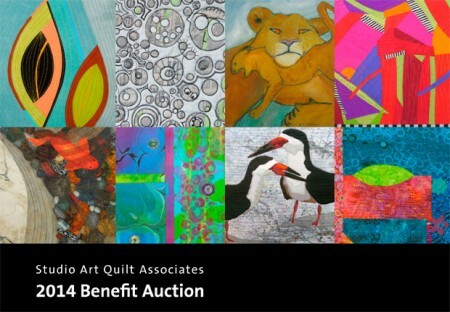 SAQA Benefit Auction is coming! The SAQA Benefit Auction will start on Monday, September 15 at 2 pm EST. I hope that you will choose to participate! This exciting reverse auction of small art works donated by members raises money to support SAQA’s exhibition, education, and outreach programs. Details on the bidding process and advance viewing of pieces up for bid can be found on the SAQA website. I am pleased to have a piece in the first group of works going up for bid. The art quilt is entitled Memories. 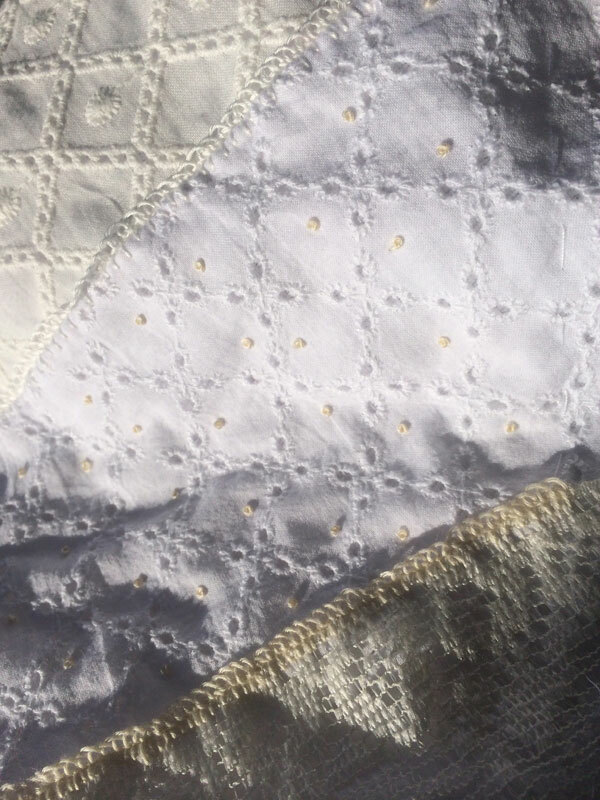 In creating Memories, I used a selection of broderie anglaise cotton fabrics which I embellished with hand stitching and then machine quilted. Have fun viewing and bidding! It is a wonderful selection. And then there was Damp Stretching……. Another new concept to me as I have been exploring the art of hand stitching has been ‘damp stretching’. It is similar to blocking a quilt or a knit project in many ways but with, perhaps, subtle differences. The intention is, partly, to remove wrinkles, particularly if you have been hooping your work, and any distortions that may have crept in as the fabric has been manipulated. It also really livens a piece up! Cork makes a great surface to stretch a piece on. I was able to create a nice sized cork surface by using some cork blocks found at a local office supply store. However, you need to be sure to test the cork that it will not bleed color on to your fabric when wet. You may need to seal the cork. Here is a photo of ‘Memories’ being damp stretched. I used straight pins to pin the piece to the cork. I also have some bulletin board pins that I have tried but they leave larger holes and I am finding that I can create enough tension to remove wrinkles with straight pins. In my stitching studies with Karen Ruanne, she suggested to begin pining in the center of one side and pin back and forth across the two sides till they are completely pinned. Then a similar process of pinning is done on the other two sides. Once pinned, you spray the piece with water until it is damp and then leave it to dry overnight. While I had always thought of blocking a piece as an option when it was finished, I have learned that a piece is often damp stretched many times while being embroidered. I imagine that this helps to minimize distortion. It also gives you a hint of what the finished piece will look like as many stitches literraly seem to shine after the process! 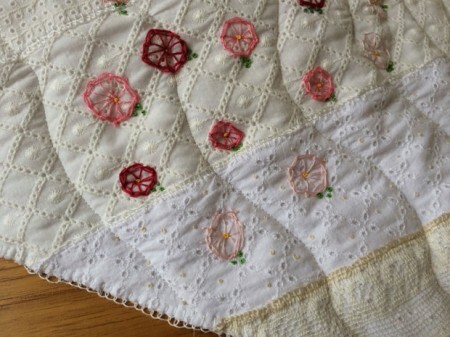 Right now, I am looking forward to the next step – free motion quilting! P.S. I am linking this post to Nine Marie”s Off the Wall Friday site, so be sure to check out what other artists have been up to this week. 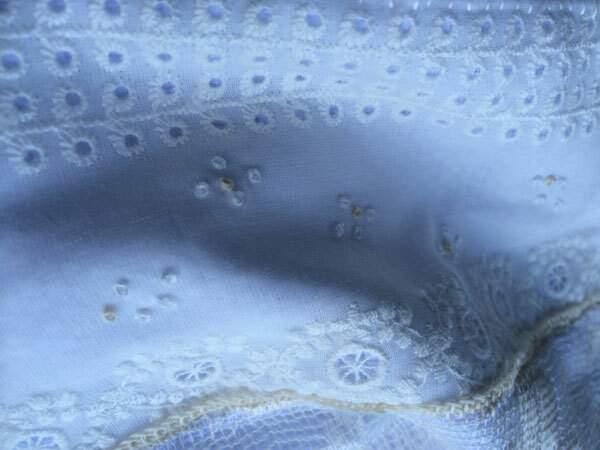 From what I can tell the stitch called the French Knot made its appearance after Chinese embroidered items began appearing in Europe in the 1690’s. It’s predecessor was the Peking knot which was also went by the title of Forbidden Stitch – supposedly because it is so fine that there was fear young girls would go blind from stitching it. The French Knot has always been my nemesis. I tried to incorporate it into various projects but never could pull it off. Finally, I have broken through that barrier and now it is one of my favorite stitches. In Memories, I have used it in a number of places. 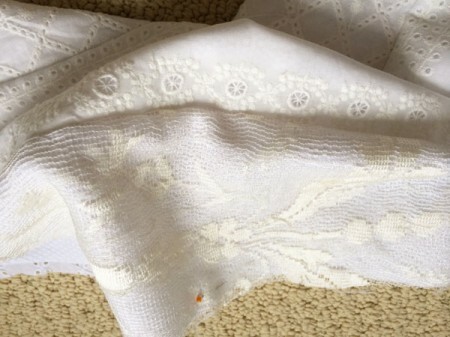 Clusters of knots appear in one strip; on another strip, French knots are scattered through across the fabric to carry over some of the off white color that appears in the other strips. Memories is evolving as it should. I made the pleasant discovery that it is relatively easy to embellish while on a plane and it definitely makes the time pass more quickly. 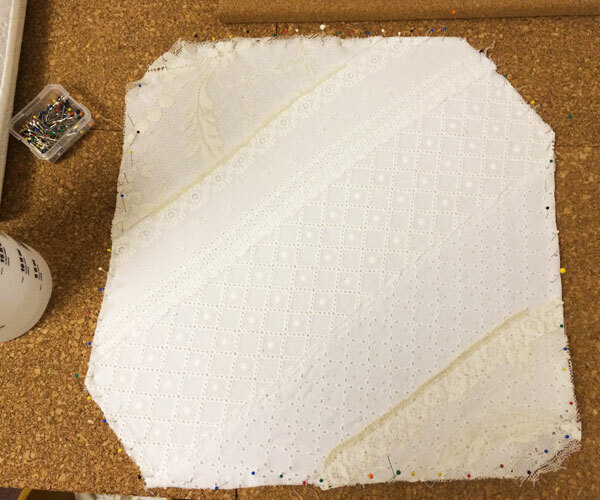 My focus the past few days has been upon the seams of my fabric strips and one loose edge of lace overlay that will form one corner of the finished 12″ square. 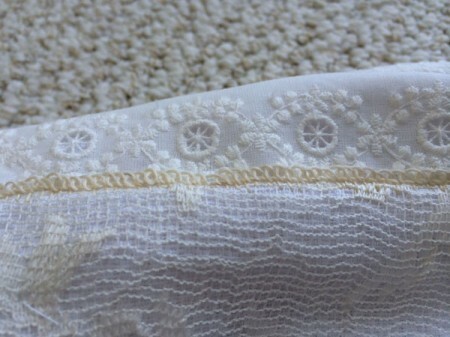 I began with adding one line of buttonhole stitching along each sewn seam and then created a more lacey effect with a second row. The ‘side trip’ that will be coming up is a special 3 week long online class with Karen Ruanne that she will be offering beginning March 24. Called Pillows and Pages, the class will follow Karen as she creates three pillows with supporting journal pages. As with any class with Karen, you are the proverbial ‘fly on the wall’, watching videos of Karen as she works and creating a work of your own, if you choose. The relatively loose format works well for me. I have come to look forward to her videos as she chats about life while demonstrating the most delicate stitchery. While I have yet to attempt a journal page in her style, I gain great inspiration from hers. Having defined one goal for myself for the coming months as the creation of an embellished pin cushion, signing up for Karen’s class seemed an obvious choice. I am grateful to have the flexibility to rearrange my other projects to fit the class in. 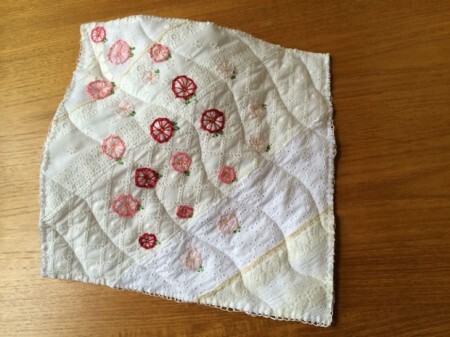 If you would like to know more about Pillows and Pages, you can find Karen’s description in this blog entry and also enjoy a glimpse of some of her work. I thought it might be fun to travel along with me while I create a new art quilt. I am hoping it will turn out well enough to contribute to the SAQA Benefit Auction this year. My intention, at least for now, is to incorporate some of the hand stitching work that I have been studying for the past three months. My working title for this piece will be Memories. Its beginning came from a sketch in one of my journals. I should explain that my journals are highly impromptu. I admire those whose journals are works of art that can stand on their own. Mine are definitely not there yet. I am simply pleased when I find the time to sketch in even the most casual way. My plan was to create strips of delicate fabric that I have been collecting the past few months, stitch them together and then begin adding hand stitching. The finished piece must be 12″ x 12″ so I began estimating size of strips to cut. 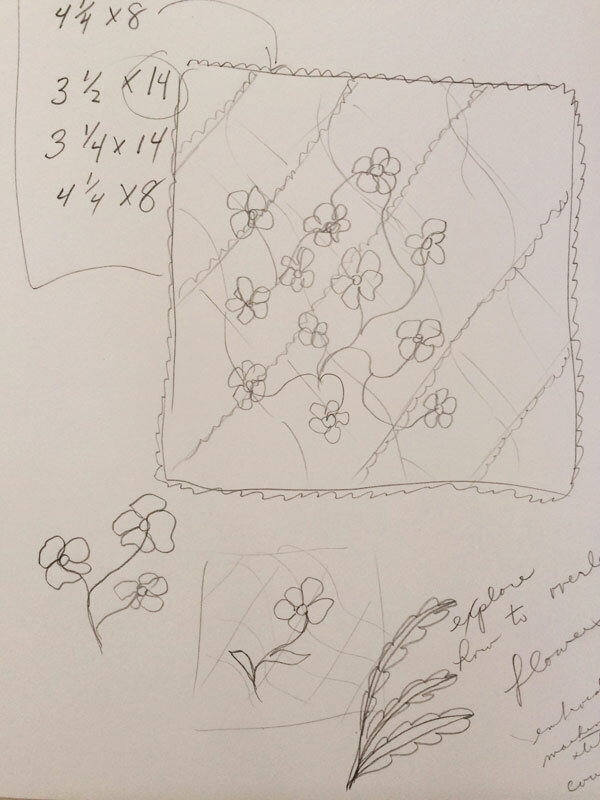 As I began to stitch some strips together, I quickly realized that my initial measurements were off but fortunately, with the help of a 12 1/2″ square ruler that I have, I was able to create an appropriate sized piece of pieced fabrics to proceed with. As you can see, these are all beautiful pieces of fabric already on their own. It is going to be absolutely delightful to embellish them and then quilt them. 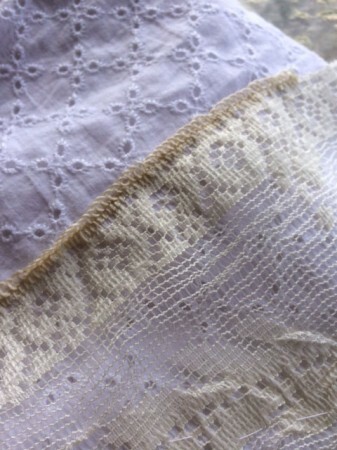 I did include some lace. 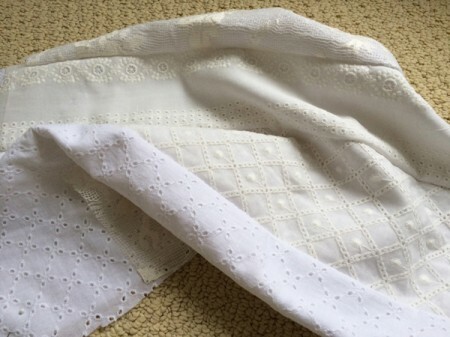 It is backed with some gently patterned white cotton that I picked up on one of my shopping trips last year in the NYC garment district. The final version of this piece is uncertain – I always let the art work direct me as it begins to take shape! I will be tossing around the idea of an overlay of flowers as in my sketch. We shall see! Hope you will enjoy following along on its creation!